Happy Friday! Earlier this week, I was seriously in shock when I realized Fourth of July was just around the corner. 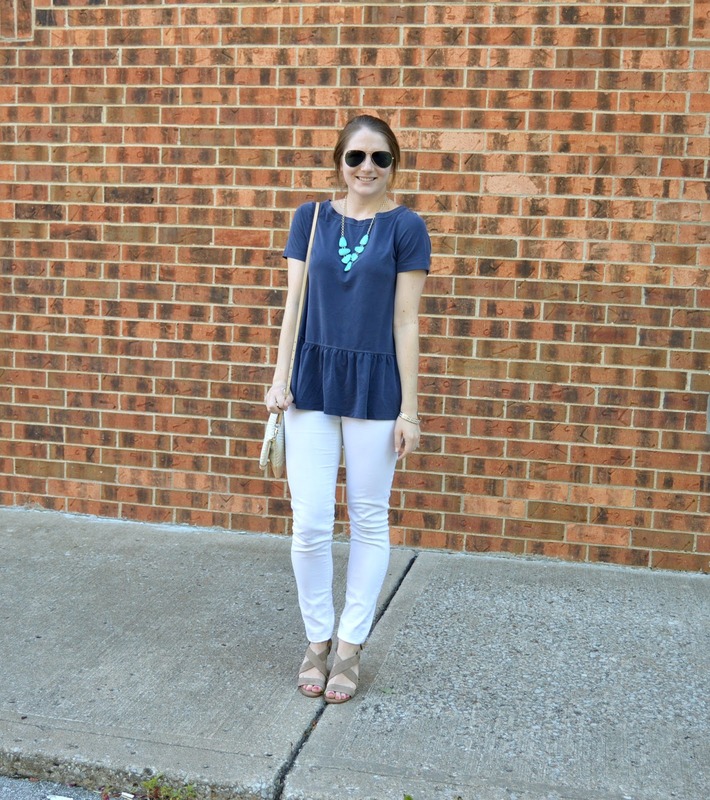 I thought it would be fun to take a look back at some of my past outfit posts where I featured outfits that would be perfect for the holiday! I have mentioned this before, but Tyler and I spend most of the Fourth of July weekend at his family cabin, so I really don't get too dressed up ever for the day anymore. Depending on what you are doing, I hope you find some outfit inspiration for the Fourth of July through these posts below! Which look is your favorite? If you're looking for some new classy shorts that will work for date night, look no further than these cute navy shorts. I am obsessed with these lace trim shorts. They are longer than most of my other shorts, but I actually really like the added length. I feel like they are the perfect shorts for date night, or any other fancy occasion. I also love that I can wear wedges with them without feeling uncomfortable. I love the combo of shorts with wedges, but I think some of my shorts are a little too short for that. I paired the navy shorts with a yellow striped tank top here, for a more casual look. However, I think these shorts would look so cute with a nice blouse. (But let's be real, it's been way too hot lately to rock something like that!) These shorts also come in a taupe color, which is a fun neutral to have in your wardrobe. They are on sale for only $33 which is such a steal for the quality of these shorts. The offer is valid until June 30th, so don't hesitate to order if you love them! Don't forget to enter to win this awesome Kate Spade giveaway before you go :). Can anyone else believe that Fourth of July is just a few short weeks away? My Fourth if always spent at Tyler's family cabin, so I really do not get dressed up for the holiday besides a swimsuit! However, prior to this tradition, Fourth of July was always a holiday I loved finding an outfit for that was festive without being over the top. I recently ordered this red and white striped tank top. Even though I didn't order it with Fourth of July in mind, as soon as I took it out of the package I knew it would be perfect for the day! In this look, I paired it with a navy necklace so I really embraced the patriotic feel. 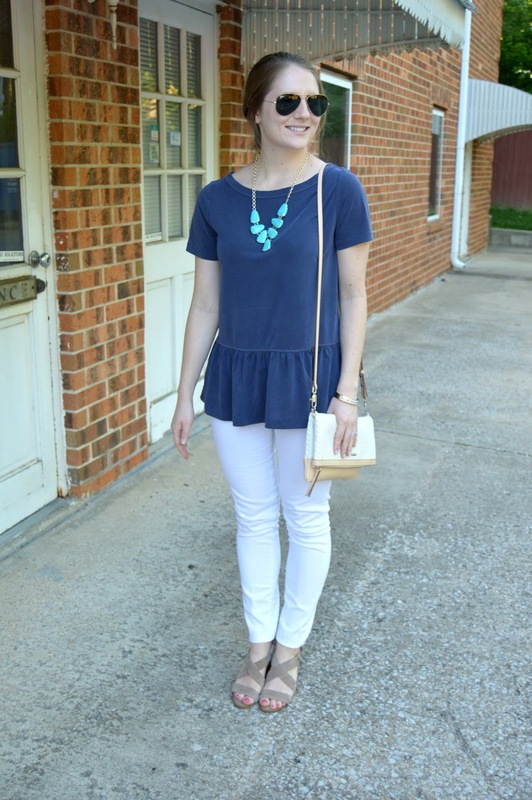 If you are looking for a cute outfit idea for the Fourth of July, definitely check out this top. (For size reference, I am wearing a small here but think an extra small would have fit better. I just didn't decide that until I cut the tag off so I'm hoping I can shrink it a little haha.) Make sure you order it now so you have it in time for your festivities! The tank top also comes in navy and is currently on sale for less than $30. Before you go, make sure you enter this fun giveaway that I teamed up with other bloggers for! 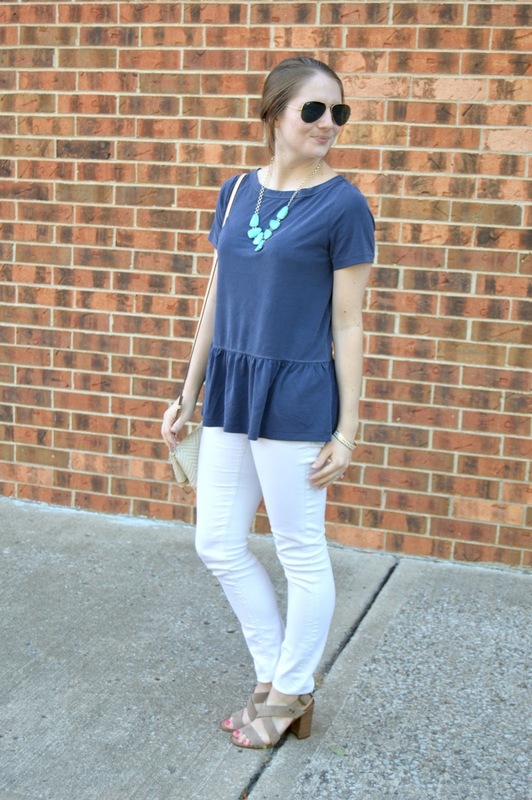 If you're look for some other outfit inspiration for the Fourth of July, browse through the widget below for some of my current favorite red, white, and blue pieces. Hello everyone! Today I am sharing with you all the London Travel Diary I put together from Tyler and I's recent trip to London. I hope you enjoy! If you would like to read more about our trip to London, head here. I shared my list of top things to do, see, and eat during your first trip to London. 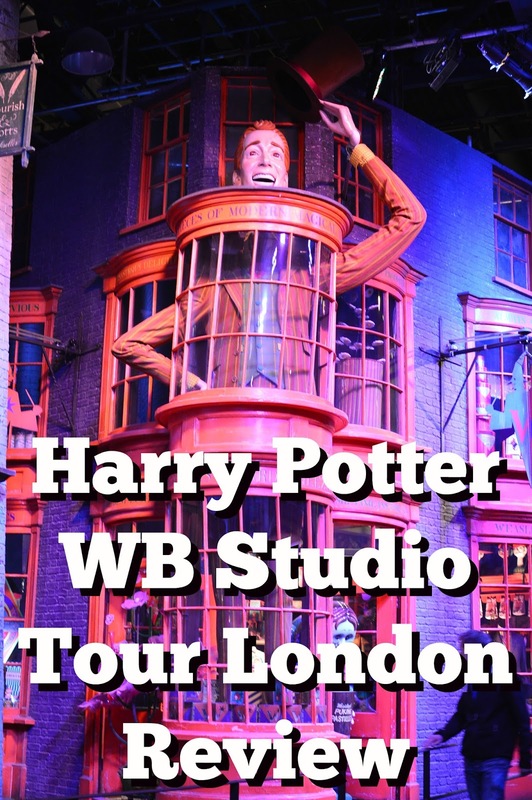 To read a review of the Harry Potter Warner Bros Studio Tour, head here. Tyler and I went to London at the end of April to celebrate our one year wedding anniversary. You can read a full recap of our trip here. In that post I talk about things to do, see, and eat while in London. One thing I left out of that post was the Warner Bros. Studio Tour London - The Making of Harry Potter. I left it out mainly because I felt like I had quite a bit to say about it! In short, we LOVED this tour. We both include it in our top three activities we did during the trip. 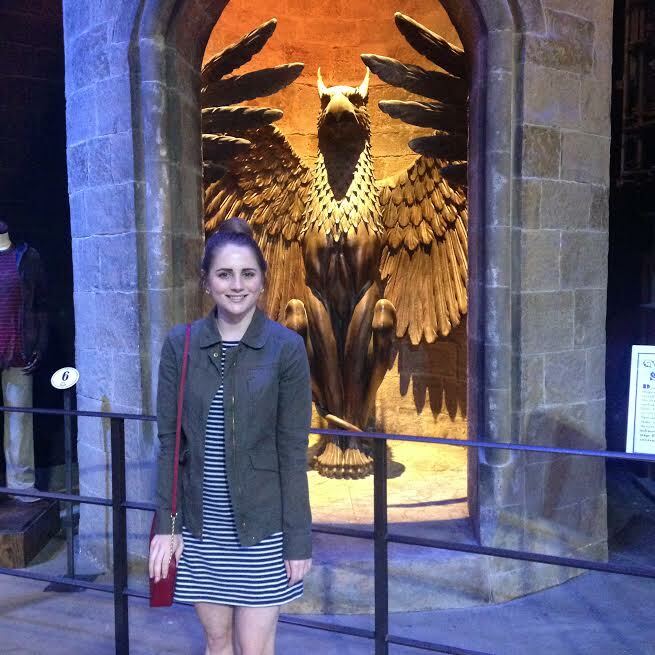 Read on for a review of the Harry Potter WB Studio Tour :). Tyler and I are both fans of Harry Potter. However, I would not describe us as "die hard fans". 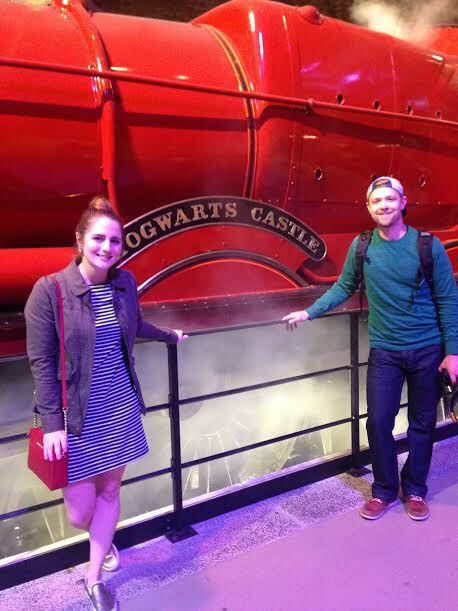 We both love the movies and have read the books but we definitely are not Harry Potter experts! We absolutely loved this tour. You obviously have to be somewhat a fan of the series in order to appreciate the tour, because otherwise what you're looking at won't mean anything to you, but I believe that as long as you enjoy the movies you will love this tour. Essentially, this tour walks you through the filming of Harry Potter. They actually filmed each movie where the tour is! You have to have a ticket in advance to get in to the tour. I booked our tickets a little over a week before our trip and there were very few tickets remaining! (You get assigned a time slot to enter, which is nice because it controls how many people are wandering around at one time.) If you only have one day available to go tour, definitely book in advance! Tyler and I had three days to choose from, so we were easily able to find a time that works for us. After that short video is completed, you enter the Great Hall. This is where all scenes that take place in the Great Hall were filmed. They also have the sorting hat in here as well as different costumes the professors wore, and the uniforms of each house. This is the last part of a tour with a guide. Someone is in there explaining what you're seeing and sharing different facts and stories about the room. After that, you have freedom to explore the rest of the building at your leisure. From there, you get to see more costumes, sets, behind the scenes videos, and more. Each set you look at, has a sign describing what you're looking at and giving you facts about it. Some examples of things you will see are the Gryffindor Common Room, Dumbledore's Office, and more. It is truly crazy to see how much detail they put into each set! At various parts of the tour, there are videos that play with more details about it. For example, where they have various brooms on display, there are videos that talk about how they made them fly and how they filmed quidditch games. The next big thing you see is the train to Hogwarts and Platform 9 and 3/4 set up for pictures! Tyler and I spent quite a bit of time in here taking pictures of us "running into the wall". Next, there is a restaurant and you can order Butterbeer. Tyler I ordered Butterbeer Ice Cream and it was AMAZING. If you ever go somewhere where you can purchase it, I highly recommend it! It leads to a courtyard type of area where they have some other attractions, like the bridge pictured above. There are more sets to tour after you eat, but the bulk of the next portion of the tour is costumes and special effects. It is really cool to learn about how they made different things look or work. What's really crazy is that the first Harry Potter movie came out in 2001, but if you watch the movie now the technology/effects still seem up to date. They really wanted to make the movies timeless when they made them, and I personally think they did a great job. The last part of the tour is a model of the Hogwarts Castle! It's honestly incredible to see the amount of detail they put into it, as well as learn about how they created. All in all, the Harry Potter WB Studio Tour London is well worth the money. Tyler and I spent about three and a half hours at the tour, but if you were really into the movies and wanted to shop in the gift shop, you could easily spend longer there. One tip is to make sure you have pounds on hand if you are taking the shuttle bus there from the train station, as they do not accept credit cards on the bus. Whether you are a child or an adult, you will find this tour incredibly special. There is so much to see and it is very informative. It is really cool to be on site where they filmed, look at the costumes they wore, and the props they used. If you ever make your way over to London, I could not recommend the Harry Potter tour more! If you have any specific questions about the tour, please shoot me an email and I will do my best to answer! I kept this dress as the main focus of the outfit and didn't overdo it with accessories. A simple pair of earrings and a patterned clutch were all it took to make this dress the perfect dress to wear as a wedding guest. I love the bright and bold color of the green. It definitely stands out! It's also easy to coordinate with your date in this color as the green complements many other colors. This dress is from The Mint Julep Boutique and they have so many cute dresses and romper in stock right now. If you are looking for ideas for what to wear to a wedding this summer, you must check out their inventory. I guarantee you will find something you like! 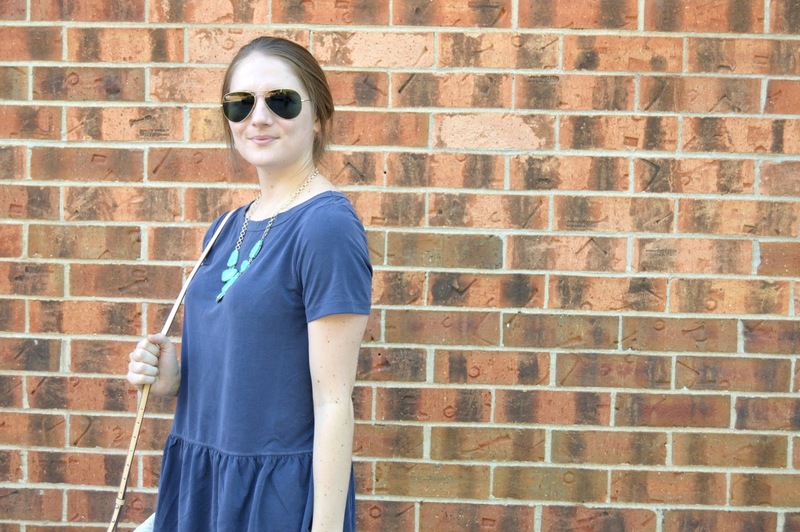 One item that has been on my radar since last fall is a chambray dress. 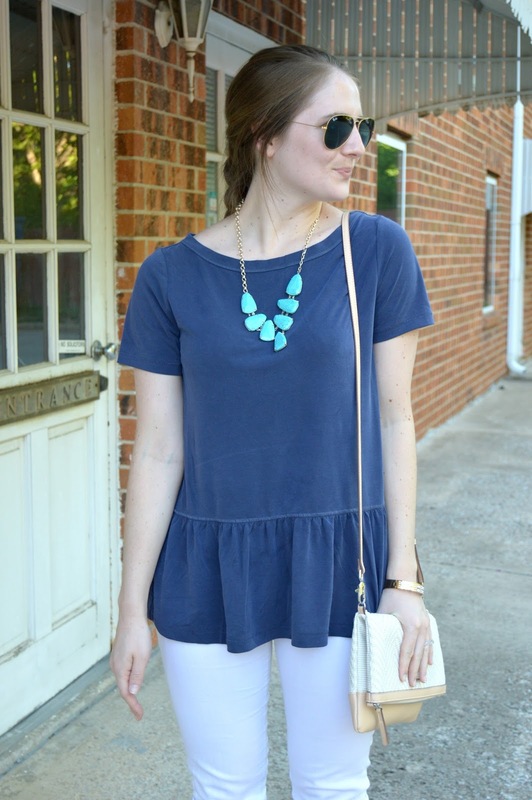 I'm obsessed with my chambray top, so it only makes sense that I also love it in dress form! 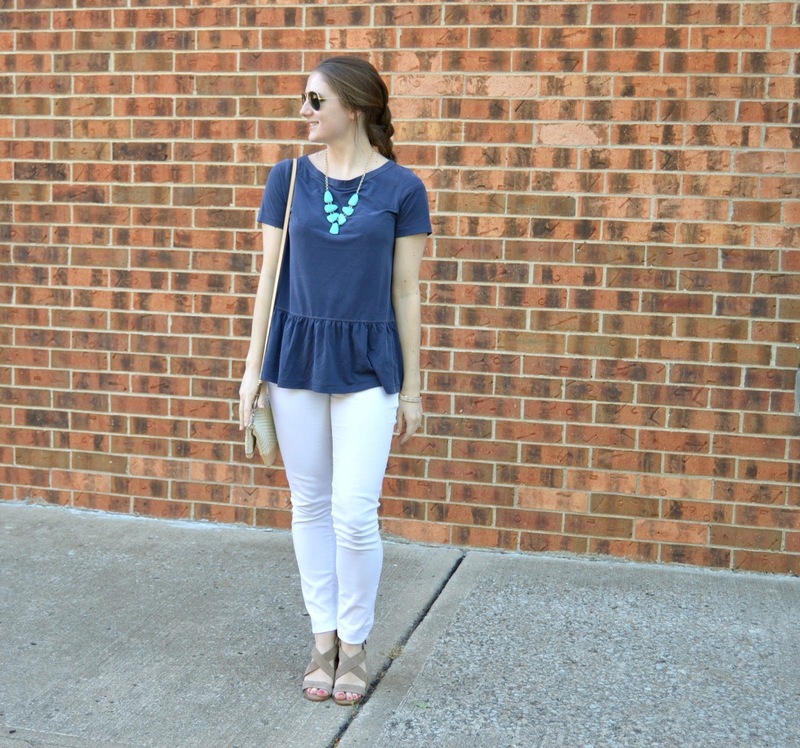 (See also Friday's post where I posted about a chambray peplum top... clearly I have a problem haha.) Last fall, I could never find one that I loved. I waited too long to decide I needed one and by then they were all picked over! This spring, a chambray dress was at the top of my wishlist. I immediately fell in love with this light wash chambray dress, but at the time it was unfortunately sold out in my size. I went to the mall over Memorial Day weekend and guess what was right in the store front window! I had to buy it. For a sizing note, I am wearing an XS. I really love this dress. I love the sleeves and the button up detailing. The only downside is that I think it might wrinkle easy. I was wearing it for about 9 hours before we took these pictures, but I feel like it got kind of got wrinkled! Hopefully it was just a one time thing :).